Building a Rustic Arbor; a Foyer for the Potager. The rustic, cedar arbor waiting for its seating. One of the things that has made weeding the kitchen garden a chore is the absence of a place to take a break. In an ideal world, there would be a somewhat shaded place, where a gardener could get out of the sun for a few minutes, with a comfortable seat and possibly a surface upon which one could place a glass of iced tea and a gardening book. So, this time around, we aimed to correct this flaw and build a 7′ wide arbor that will accomodate a bench or two. If you’re starting a new kitchen garden plan to include a somewhat shady spot to sit. It will make spending time in the garden so much more pleasureable. Because our land slopes down into the garden, Andrew created a couple of short steps and a ‘floor’ surface paved with large, flat granite stones. The voids (or joints) between the stones are filled with sand and then fine, crushed stone. As a finishing touch, Andrew liberally sprinkled seeds of creeping thyme over the surface and gently washed them into the crevices. Thyme is a slow germinator and has a comparatively low germination rate so we expect to see more weeds than thyme, but we’ll keep an eye on it. When we get around to it we will build some rustic benches. (The gate opens out, not in). We’ve planted the arbor with climbing things, champagne grapes and clematis, to create a sort of bower, and we will likely allow some of the self-sown morning glories from last years garden fence to join the cedar climbing competition. 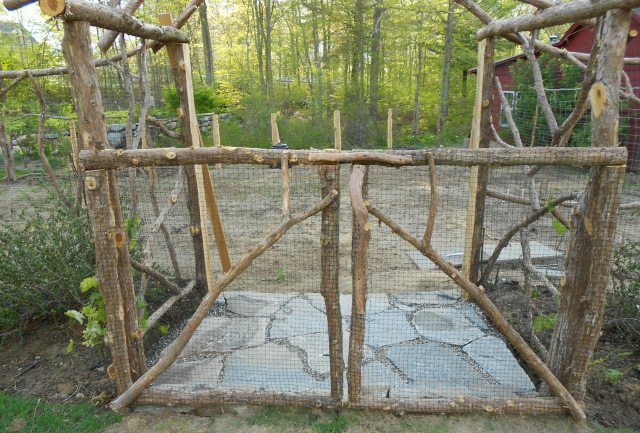 Two small, curved, planting beds on either side of the arbor will make it easier to mow around the garden and the japanese quinces that we’ve planted in the corners will give the chickens a place to take cover when the hawks are looking for lunch, rather than in the perennial borders. 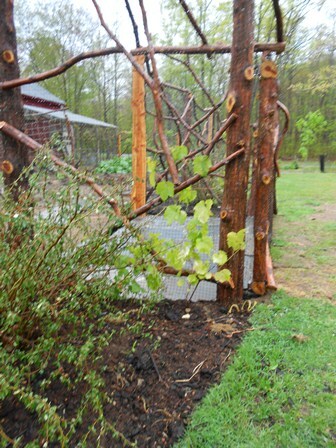 Grapevines have been planted at the base to create a bower.